The sky is a fundamental part of many landscape pictures. The sky, in particular a blue, open sky and its blueness are usually synonyms of happiness, freedom, oxygen, deep breath and lightness. Head over Colormatters.com for a more in-depth analysis of the color blue. When people feel free, relaxed, or just need to take a rest from the troubles on earth, they look up and search for the sky. This is reflected in the pictures we take. The sky is an important component of all things happening on earth. However, the sky is literally “out of the picture” when horrible human-driven things, such as war, oppress us humans. Our tunnel vision leads us to focus on what happens on the ground. And the sky, again, is literally out of the picture. Let’s see what we can learn from pictures taken in the shattered (as of August 2016) city of Aleppo, Syria. Is the sky really gone from this troubled city? Can we use Google image search to compare the skies of Aleppo with the skies of other cities? Do Google pictures betray the horror ongoing in Syria? I decided to compare the pictures taken in Aleppo (as of August 2016) with pictures taken from other cities around the world – I will present two cities that are close to my heart: Toronto and Rome. After a quick Google image search we (i.e. eye/brain-endowed creatures) immediately perceive the horror and destruction from these pictures. But say that an extraterrestrial life-form had access to these pictures and this life-form was only capable of perceiving colors. What would it see? How can we quantify the differences between these pictures? How can we quantify the blueness of the sky? Due to the gravitational system we live in, 99% of the times the sky is included in the top third of the picture (unless you’re looking for more creative angles). 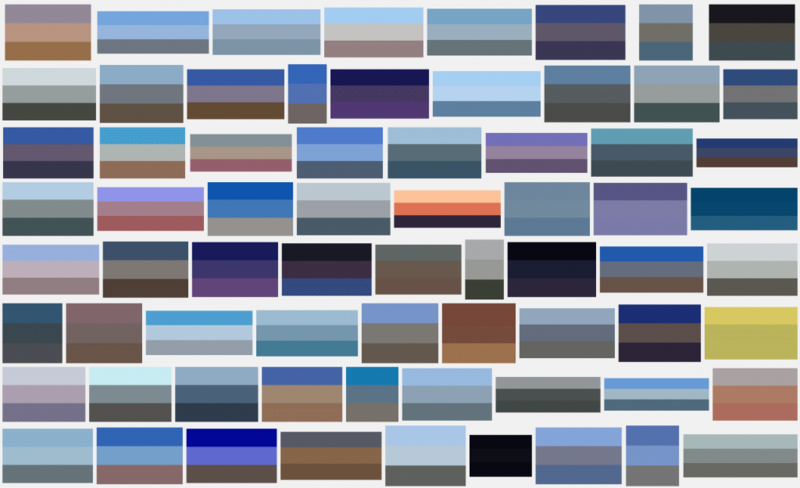 So, splitting the image in horizontal thirds may be a rule of thumb to quickly find the sky in the pictures. 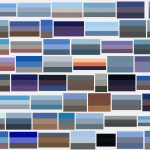 I searched for: “clear blue sky“, “sky“, “landscape with blue sky“, and a number of major cities (Rome, Toronto, Aleppo…). I then took a screenshot of the resulting page (after zooming out to ~33%). find the average color of each third. This movie shows the FIJI script in action. Toronto’s pictures look nice when split in thirds. There is a good color balance and variability. The top third is definitely blue-ish. We get a very different feeling from Aleppo’s pictures. 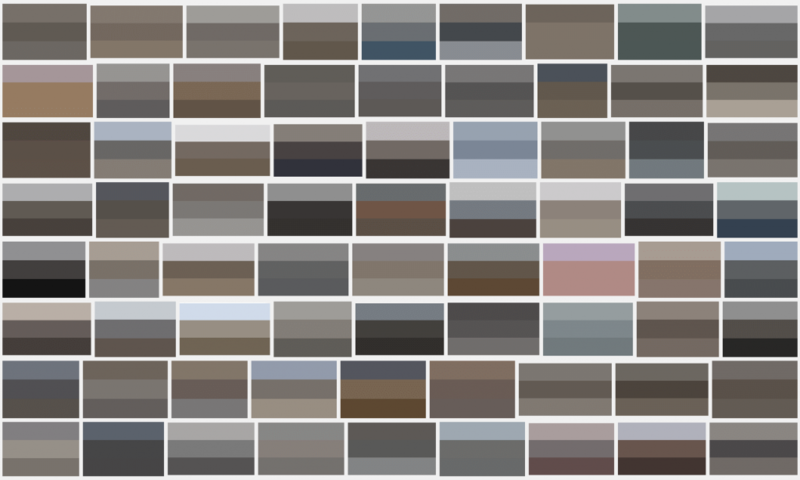 These are definitely earthy tones (rubbles and collapsed buildings…) with very low variability. 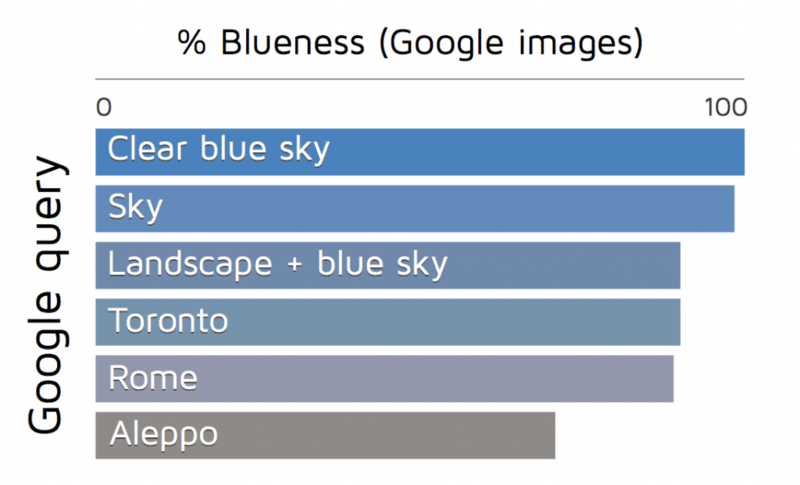 Overall, the top third is very far from being blue..
And when we compare the median RGB Blue value (0-255) of the top thirds taken from different queries we get the overall picture. The “Clear blue sky” query is used as the gold standard (i.e. its top third represent the 100% blue) and the other queries are scored against this standard. This post was originally written at the beginning of August. Data visualization is not suitable for the communication of emotions. I have never seen a visualization (i.e. any combination of colors / shapes / numbers / animations) capable of capturing the acute human ability of reading the world through emotions. When human lives are at stake, numbers, colors, shapes (i.e. data visualizations) are just an abstraction that suppresses the original emotions and feelings. Pictures and words, they do work! So, go out there and read about Syria!